Before Managing Brokers go to the IDFPR website to renew their licenses, they should gather some important information at their fingertips to make the process go as smoothly as possible. To get started, you’ll need your managing broker license number and you’ll need to provide one of the following: your date of birth, your Social Security Number or the PIN on your renewal post card that you received from IDFPR. You’ll also need a valid VISA, Mastercard or Discover card to pay online. Remember, additional service fees will apply for using these cards. NOTE: Do not wait until the last day to renew your license online. 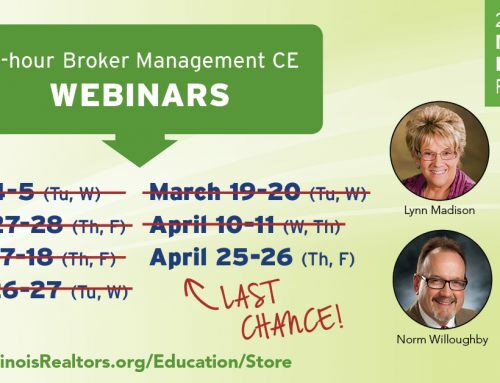 As we all know, there can always be technical difficulties, especially when there are thousands of Managing Brokers trying to renew their license at the same time. Rest assured and renew your license today. Additional FAQs regarding the Managing Broker Renewal.